Tomato seeds for this tall, leafy variety were sent to Gary Ibsen in 1990 from a gardener in Boone County, WV who shared that he had been growing these, and a favorite red variety for 40 years. 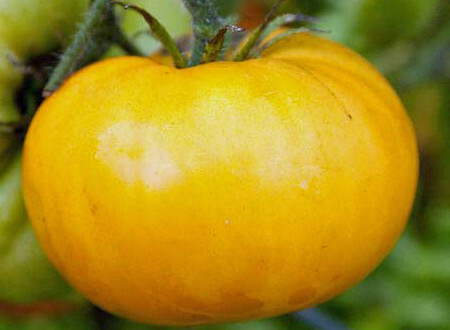 He was given the tomato seeds from his Uncle who had grown them in Tennessee. Potato leaf plant produces lots of very juicy, 14 oz. , brilliant orange-gold globes with tropical fruit flavors with enough acid balance to guarantee a burst of tomato delight.